BAGLUNG, NEPAL — In Rangkhani, a remote mountain village in western Nepal, a 12- hour walk on steep dirt roads from Baglung, the district’s chief town, families until a decade ago used kerosene and butter lamps to banish the darkness when dusk fell. Communication and health care were poor. Work, apart from traditional farming and small trade, was scarce. But since 2001, a microhydro project has harnessed the tumbling waters of the nearby Kalung Khola river to provide electricity for Rhangkhani and neighboring villages. The World Bank estimates that Nepal’s swift-flowing torrents could supply as much as 83,000 megawatts of electricity through such projects, some without costly and environmentally damaging dams, making them one of the largest untapped hydro power resources in the world. “Nature has given us tough terrain: It’s difficult for infrastructure,” said Bhupendra Shakya, a renewable energy expert in Katmandu. “But it’s suitable for hydro,” added Mr. Shakya, who works with Renewable Energy for Rural Livelihood, a project run jointly by the Nepalese government, the U.N. Development Program and the World Bank. When the Kalung Khola plant was built, the villagers at first did not believe that water could create electricity. Khagaraj Sharma, 48, a school teacher, recalled in a recent interview how 150 people had gathered at the small powerhouse for the startup ceremony. All eyes were fixed on a light bulb outside the one-room concrete shed housing a generator powered by running river water. When the bulb glowed, villagers cheered and danced. “Many did not believe it would happen,” said Mr. Sharma, who is today secretary of the cooperative that manages electricity in Rangkhani and a cluster of nearby villages. At first, villagers used electricity chiefly for lighting. Then, with guidance from local and international agencies, new businesses sprouted, and incomes started to rise. The microhydro plant in Rangkhani cost about 2.6 million Nepalese rupees, or $29,000, to plan and build, and generates 26 kilowatts of electricity for more than 1,000 people. A “run-of-the-river” plant powered by water channeled directly from the fast-flowing stream, without any containment dam, it flooded no land and creates no greenhouse gas emissions. After spinning the generator’s turbine, the water feeds back into the river downstream. Microhydro power plants are defined by the government’s Alternative Energy Promotion Center, the umbrella organization for the renewable energy program, as those generating less than 100 kilowatts of electricity. By way of comparison, a small conventional hydro plant generates about 10 megawatts, or 100 times as much electricity as the largest microhydro plant. A big hydro plant like the Three Gorges Dam in China generates 22,500 megawatts. For Rangkhani’s microhydro plant, part of the flow of the Kalung Khola was diverted via a series of concrete and stone channels built over the lush, hilly terrain, then funneled down to the powerhouse through a pipe called a penstock. Strategically channeling the river gets the most out of the water’s speed and flow, creating the most efficient conditions for driving the turbine blades that convert gravitational energy from the falling water into electricity. Transmission cables from the powerhouse carry electricity to buildings in the neighborhood. In contrast with the dams, flooding and dislocation of communities associated with large hydro power projects, well-planned run-of-the-river microhydro plants do minimal damage to surroundings, energy experts say. Microhydro plants “do not have major environmental impact compared to large hydro and storage hydro,” said Rabin Shrestha, senior energy specialist with the World Bank in Nepal. Although the landscape is altered, the channels are similar to the canals that from time immemorial have carried water for crop irrigation for great distances across the countryside, and a government regulation requires that at least 15 percent of the river water be left to flow along the natural riverbed. 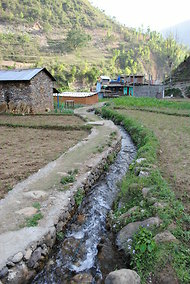 Drinking supplies are also not affected, since mountain villages like Rangkhani typically rely on springs rather than rivers for their drinking water. Electricity has brought major changes to village life. Tul Kumari Sharma, 33, a mother of three, now runs a small grain mill powered by electricity, no longer grinding grain by hand as she did before. Life with electricity is “like heaven,” Ms. Sharma exclaimed. Daughters-in-law, who bear the brunt of housework in Nepal, used to be thin and ill: These days they are “quite healthy,” she said. Electricity in Rangkhani costs about the equivalent of 8 cents per kilowatt-hour and the average household uses 12 units in a month, a rate made all the more affordable by a rise in incomes from new work opportunities. Drona Ban, 28, said he used to make $2 a day doing casual labor: With access to electricity he started a noodle-making workshop and now earns a profit of as much as $8 a day. Small grain and saw mills now operate in Rangkhani. Chilling vats keep buffalo milk cool before it is carried in 40-liter, or 10-gallon, barrels to a processing center 10 kilimeters, or six miles, away. Shops and modest roadside restaurants have refrigerators to keep food and drink cold. Mobile phone towers have been built. On a recent day an old village woman, carrying an enormous bundle of green branches on her back, was talking on her mobile phone as she hiked along a cliff-hugging road. Hydro power accounts for about 90 percent of Nepal’s electricity. Yet electricity itself is only 2 percent of the country’s total energy consumption, according to the Center for Rural Technology, a nongovernment development organization based in Katmandu. Nepal has a bustling tourism industry and cities with modern amenities, but 84 percent of its population is still rural. Burning biomass — wood, dung or other organic matter — accounts for 86 percent of Nepal’s total energy consumption. Deforestation has been a major problem for decades, while pollution from burning biomass is getting worse. Only about 56 percent of people use electricity at all. Even in the towns, power supply is a pressing problem. During Nepal’s civil war, from 1996 to 2006, construction of generating plants and other infrastructure ground to a halt. In recent years, 14-hour power cuts have become routine, even in Katmandu, the capital. Meanwhile, energy consumption has continued to increase. Nepal’s annual peak power demand reached 950 megawatts last year, outpacing capacity of 705 megawatts, according to the Nepal Electricity Authority. The country’s energy demand grew 10 per cent in 2010-2011 from the level of the previous year. For remote villages in Nepal, it would take years or decades to connect to the national electric grid. Microhydro power plants like the one in Rangkhani can bridge the gap. An estimated 2,200 microhydro plants, generating a total 18,000 kilowatts, have been built in Nepal since the 1970s, according to Nepal Micro Hydropower Development Association. Funding and support comes from Nepal’s government, as well as international agencies like the U.N. Development Program, the World Bank and Norad and Danida, the international aid agencies of Norway and Denmark, respectively. Unlike Nepal’s blackout-plagued urbanites, Rangkhani’s villagers have uninterrupted power, rendered more secure by the installation of a minigrid last year, interconnecting with five other nearby microhydro plants. Establishing microhydro plants in Nepal takes about 21 months, including a feasibility study, review, government approval, construction and installation. For U.N.-supported projects like those in the Renewable Energy for Rural Livelihood program, the first six months are devoted to educating the local community about the plant and electricity, and creating community organizations to help manage operations. Building the plants is not enough: In the 1970s, Nepal’s government built microhydro plants in rural areas, but within a few years many of them broke down because of a lack of community involvement and maintenance systems. Inadequate demand from paying customers left the plants unsustainable as businesses, earning too little to hire operators or pay for repairs and maintenance. There have been other challenges too: Microhydro plants have suffered from a high turnover of operators. After coveted training and a few months of experience, they often jump to better-paid jobs in the Middle-East Gulf countries. Financing, meanwhile, can be difficult. About 60 percent of costs are funded by national and local government and 20 percent is covered by volunteer labor from the community. The remaining 20 percent is usually covered by loans. Conventional Nepalese banks are reluctant to lend, leading to project delays. However, special funds supported by the German aid agency GIZ and other international organizations help to fill the gap. Today, there is a strong emphasis on giving communities responsibility for plants, training local support technicians, and helping villagers build up small businesses to increase incomes and electricity demand to make plants financially viable. In the village of Dagatundada, 63 kilometers from Baglung, a 75 kilowatt microhydro plant started running five years ago with help from Renewable Energy program. The Dagatundada plant supplies power to 860 homes, or about 4,000 people and uses for its electricity have blossomed. A small health clinic has expanded, adding microscopes and an X-ray machine. With electricity, machines in a small workshop make fragrant cakes of soap for sale in city shops. In a small studio a 40-watt licensed FM radio station airs news, music, and public service announcements. At least 100,000 people in two districts can hear the broadcasts. Tribhuvan Secondary School has 15 new minilaptop computers funded by Winrock International, a U.S. nonprofit. Teachers there said that before the village had electricity, only about half the students passed their final high school examinations. Now, 80 percent pass. Children spend less time on household chores, like gathering firewood, and more time studying, the computer teacher, Kamal Paudel, said. Ram Bahadro Kunwar, 26, opened a poultry farm last September. A large shed on a riverbank houses 1,000 clucking chickens. Electricity helps incubate chicks and provides lighting to tend them at night. Mr. Kunwar says he was a Maoist rebel during Nepal’s civil war and he confesses to being surprised that he is now running a small business that earned him about $1,000 when he sold his first batch of chickens late last year. As a guerilla soldier, Mr. Kunwar thought only “about changing the country,” he recalled. With electricity, change is indeed happening in rural Nepal — but in a different way than he had imagined.